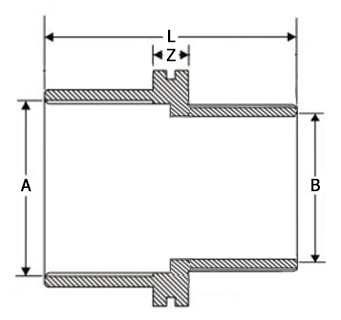 This female to male reducing socket is used to join two threaded pipes of different dimensions. The larger pipe will be male threaded and the smaller pipe will be female threaded. BLK PP Reducing Socket F x M Thread 3/4" x 1/2"
BLK PP Reducing Socket F x M Thread 1" x 1/2"
BLK PP Reducing Socket F x M Thread 1" x 3/4"
BLK PP Reducing Socket F x M Thread 1 1/4" x 3/4"
BLK PP Reducing Socket F x M Thread 1 1/4" x 1"
BLK PP Reducing Socket F x M Thread 1 1/2" x 1 1/4"
BLK PP Reducing Socket F x M Thread 2" x 1 1/2"
BLK PP Reducing Socket F x M Thread 2 1/2" x 2"
BLK PP Reducing Socket F x M Thread 3" x 2"
BLK PP Reducing Socket F x M Thread 3" x 2 1/2"
BLK PP Reducing Socket F x M Thread 4" x 3"